Samsung’s latest wunderkind the Galaxy Note9 is the latest successor to their prestigious line of power phablets. 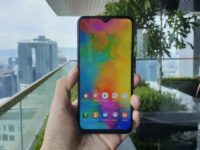 Since its global debut and its high profile launch in Malaysia, we’ve had the opportunity to put it through its paces and see what they hype is all about. The Galaxy Note9 isn’t just the usual case of a minor bump up the stat sheet – it’s a thorough revamp that addresses almost every pain point smartphone users presently face and then adds on several unique additions that at first seemed like novelties but which have now become an indispensable aspect of how we use a smartphone. 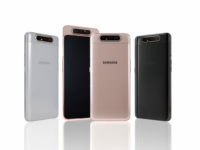 It also holds the enviable honour of being the most powerful phone that Samsung has ever made by sheer dint of the amount of high-performance hardware that they’ve crammed into its 8.8mm thin mirrored chassis. Allow us to take you on a power-packed round-up of 9 outstanding reasons on why the Galaxy Note9 ought to be the next phone you own. It has been said that the way you use a smartphone is often contingent on its battery life. More than a few smartphone users across brands often have to go through their day nursing the battery life on their phones between charging points in as frugal a fashion as possible. That’s like owning a sports car but driving it at double digit speeds for fuel economy which just isn’t done. That or having to tote around a heavy, chunky power bank about their person. The Galaxy Note9 has a means to ditch all these somewhat undesirable complications as it comes with a massive 4,000mAh battery that is capable of realistically offering all-day battery life. The Galaxy Note9s built-in 4,000mAh battery has wired and wireless fast charging support too. To date, this is one of the largest batteries crammed into a Galaxy Note series phone but what is really impressive is how they’ve managed to retain the slim dimensions of the Galaxy Note9 with a battery this large on account of superior engineering and design rather than ending up with it looking like a proverbial brick. Compared to its predecessor the Note8 that only had a 3,300mAh battery, the Note9 is only a wee smidgen heavier, thicker and wider. Better yet, the Galaxy Note9 also supports fast wired and wireless charging too. Another pain point that the Galaxy Note9 addresses is the lack of storage in phones. It comes in two storage configurations, one with 6GB RAM and 128GB of storage and a more powerful variant with 8GB RAM and a whopping 512GB of onboard storage. While other phones are content to leave it at that, the Galaxy Note9 has a hybrid SIM card tray for variants in the Malaysia market that allows users to augment this storage further by cramming in up to a 512GB microSD card. The immense storage on the Galaxy Note9 of up to 1TB means you can snap away with abandon for videos and pictures alike. In theory, you can get a whopping 1 Terabyte of usable storage in total with the 512GB storage variant of the Note9 and a 512GB microSD card. To put this into perspective, a terabyte of storage can hold a good 900 or so movies, assuming each is about 1GB in size, give or take the odd special edition or two. That’s enough movies to last you several trips to New York and back. 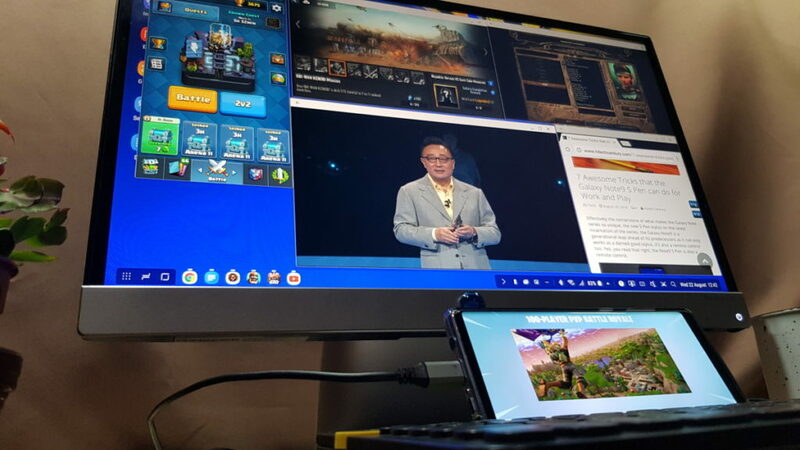 The dream of having one device capable of tackling all the tasks you need – gaming, paperwork, content consumption – is an elusive one but the Note9 may yet be one of the closest to achieve it as it has a unique DeX mode that lets you use the phone as an ersatz PC of sorts in desktop mode by simply hooking it up to a monitor via a HDMI cable. The clincher here is that any HDMI adaptor works – there’s no proprietary dongles, special ports or whatnot. Just pick a USB Type-C to HDMI adaptor from any IT supply shop, bung one end into your Note9 and the other into a monitor with a HDMI port and you’re good to go. 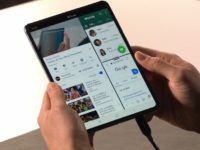 The Galaxy Note9 has a unique DeX mode that fires up a desktop interface by mere provision of a HDMI cable and a monitor. When you fire up DeX mode, you’re able to access a desktop style interface that has all the conveniences you’d expect – file drag-and-drop functionality, folders and the like. While it works best with a wireless mouse and keyboard, the Note9 can ditch all this as the phone’s touchscreen can work as both a touchpad and a keyboard in a pinch. Better yet, if you’re a power user, you’re able to use the phone to do one thing and perform another on the paired up display. Finally, your dreams of gaming and watching Netflix at the same time off one device have finally come true. Work on your spreadsheets on the main display and watch movies on your Note9? Equally possible too! 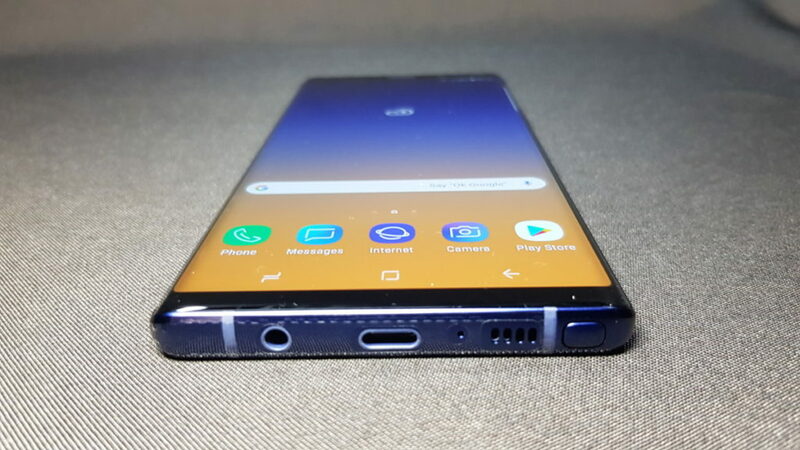 Befitting its status as their premier phone, the Note9 comes with the best cameras that Samsung has to offer in the form of a rear dual 12-MP camera array on the back of the phone. 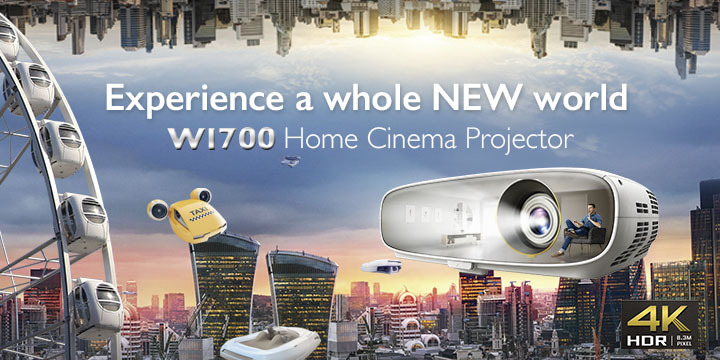 Both cameras have optical image stabilisation to ensure judder free videos and snaps. The clincher here is that the primary camera has Samsung’s vaunted Dual Aperture tech that first debuted on the Galaxy S9 earlier this year. In effect, Dual Aperture tech incorporates an actual mechanical aperture that can shift automatically from f/1.5 for shots in low light to f/2.4 for shots under bright daylight. You can, of course, manually control this for artistic effect. The other dual camera has 2x optical zoom to capture shots from far off. The rear dual camera array consists of two 12-MP OIS stabilised cameras with one having Dual Aperture tech and the other 2x optical zoom. Combined, both rear cameras allow for Live Focus mode lets you capture snaps with a beautifully defocused background much like what high-end professional cameras are capable of performing. You’re even able to dial the level of background blur you want too. Add in a super Slow-Mo 960fps mode, hyperlapse mode as well as smooth 4K video capture and you have the makings of one of the most powerful cameras ever crammed into a smartphone. The front 8-MP selfie camera is nothing to sneeze at as well as it has a bright F/1.7 aperture and autofocus too. The Galaxy Note9 has one of the largest, brightest and sharpest displays ever mounted in a phone which makes it ideal for both gaming and watching movies, two tasks that it excels in on top of being a portable productivity centerpiece. The 6.4-inch Quad HD+ Super AMOLED display has a resolution of 2,960 x 1,440 pixels and a crisp 516ppi but where it knocks the competition out of the ballpark is that it has been recognised as a YouTube Signature Device by the titular global purveyor of funny cat videos. 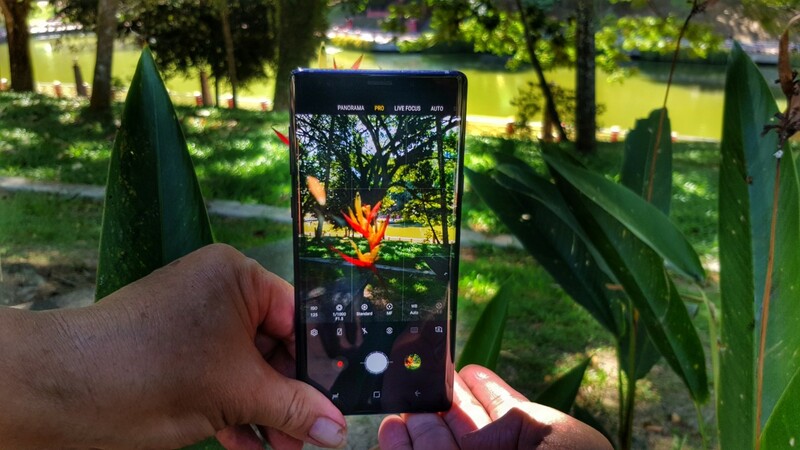 The Galaxy Note9 makes the cut on account of its sterling ability to support High Dynamic Range (HDR) content, a high frame rate, reliable digital rights management (DRM) performance, 4K content decoding as well as supporting next-gen codecs. Pro Tip: Out of the box, the Galaxy Note9 is set to Full HD+ resolution by default but you can go into settings and dial it up to its full WQHD+ glory. 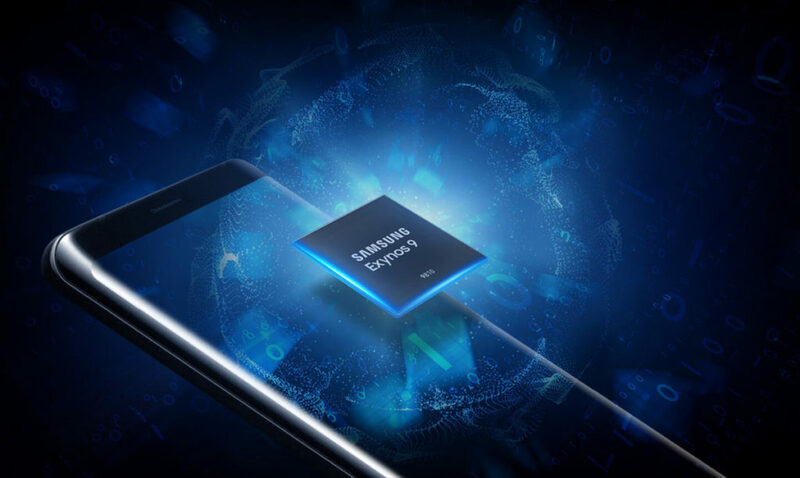 Running under the hood of the Galaxy Note9 is Samsung’s latest Exynos 9810 octacore processor that is built on a 10nm FinFET process capable of delivering more performance with less power compared to its predecessor the Exynos 8895. The new Exynos 9810 in the Galaxy Note9 consists of a quartet of custom CPU cores capable of 2.9GHz clock speed and a quartet of Cortex A55 cores capable of up to 1.9GHz to handle general grunt work. The Exynos 9810 also packs the latest ARM Mali-G72 GPU that has been built on ARM’s second-generation Bifrost architecture for smoother, better graphics when gaming. 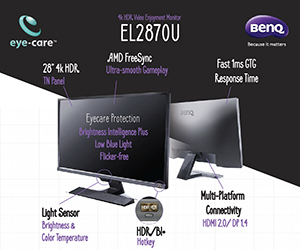 This is paired with either 6GB or 8GB of RAM, depending on which storage configuration of the Galaxy Note9 you invest in though both are immensely capable in their own right with the ability to support multitasking, intensive gaming for demanding titles like Fortnite, the ability to record ultra slick 4K UHD video and more. Where it ups the ante over the competition is the inclusion of a Water Carbon Cooling system, a thermal spreading pipe built into the Galaxy Note9 that helps to disperse the heat from the Exynos 9810 processor so that it can run in at peak performance more consistently. In terms of efficiency, the Galaxy Note9’s Water Carbon Cooling system is almost three times greater than its predecessor the Galaxy Note8. That’s both literally and figuratively cool! 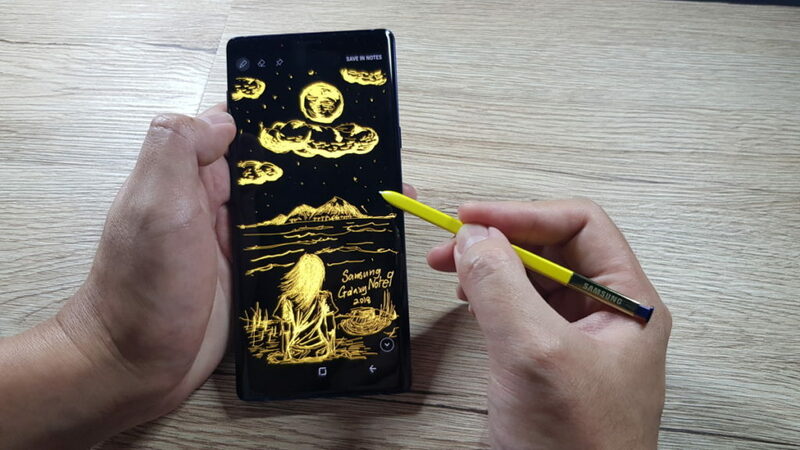 The centerpiece of the Galaxy Note series phones, the S Pen stylus has an ultra-fine 0.7mm tip and 4,096 levels of pressure sensitivity, allowing you to draw, doodle, write and otherwise use it much like a real pen across the entirety of the virtual canvas that is the Galaxy Note9’s huge 6.4-inch touchscreen. When inspiration strikes, you can also pop it out of its recessed stylus well to take notes or even a sketch or two when the screen is off in Screen off memo mode. The responsiveness of the S Pen lends itself well to drawing and the odd note or two to self. 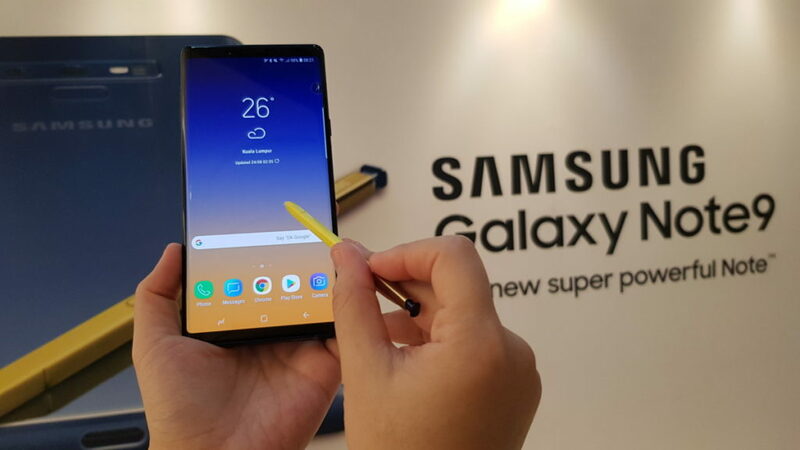 The biggest feature update it has this time around for the Galaxy Note 9 is that it has Bluetooth Low Energy (BLE) connectivity built into it that allows you to use the S Pen as a remote control for a variety of tasks up to 10 metres away from the phone. Need to take a wefie or selfie? The S Pen can act as a remote shutter by simply pressing the button once you’ve set up the Note9 in the right spot. Need to control playback on your music or videos? The S Pen can do that too. It’s also a dab hand as a PowerPoint controller so you can manage your presentation like a boss. 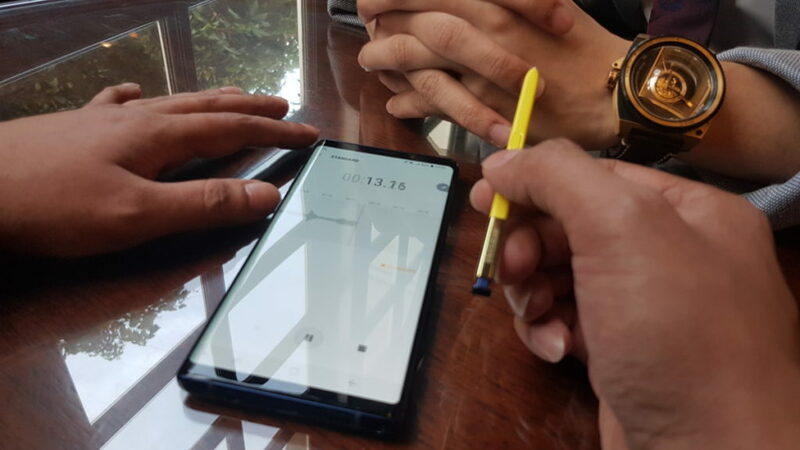 The S Pen on the Galaxy Note9 has BLE connectivity, allowing it to act as a remote control for a variety of tasks. On a more whimsical side, you can also personalise your AR Emoji stickers by adding more handwritten messages too via the S Pen. In the unlikely event that you get it soused in the rain, fret not as the S Pen itself, like the Note9 is rated IP68 for water resistance so you can survive a quick 30 minute dip in the pool. The Galaxy Note9 comes in three different colour for Malaysia – Midnight Black, Metallic Copper and Ocean Blue. Bar the Ocean Blue variant which has a yellow S Pen, the other two colour variants come with S Pens in colours that match their finish. Externally, the Galaxy Note9 has a slick looking mirrored backplate with dia-cut edges along with a rear-mounted fingerprint reader inset just below the rear dual camera array. The phone is also rated for IP68 water resistance, allowing it to survive a minor sousing in the pool or shower without untoward effects. This effect even extends to the S Pen itself and works equally well too when the S Pen is removed from the Note9 as the entirety of the stylus well has also been rendered water resistant in addition to the 3.5mm audio jack. That means more time living life than worrying if your phone will keep up (and survive). As a first for the Galaxy Note series, the Galaxy Note9 comes with a pair of stereo speakers tuned by AKG which makes both gaming and watching movies a real treat. The Galaxy Note9 also has support for Dolby Atmos too for a more immersive effect and it also plays a host of all the usual high-end audio file formats to cover all the bases. If you’re in the mood for some private listening, the Galaxy Note9 comes with a pair of AKG earbuds which have proven to be one of the better stock earbuds that you can get out of the box. That’s quite literally sweet music to our ears.